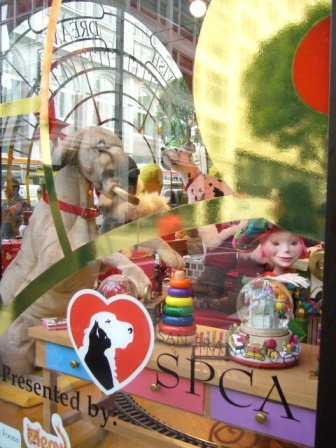 The now traditional San Francisco SPCA windows at Macy’s seemed a little scaled down and unfocused this year, and the rest of the windows at the prime Stockton & O’Farrell corner by contrast were devoid of any visual interest. The 3 fabulous, cropped Harleqin Great Dane mannequins from last year (see December 2008 entry and photo) were nowhere to be seen, but purebred models still ruled with the lone Harleqin, a Chinese Shar Pei and the fawn Dane with natural ears gracing the corner window. The Monday afternoon we were there, the only live animals on display were a few cats. 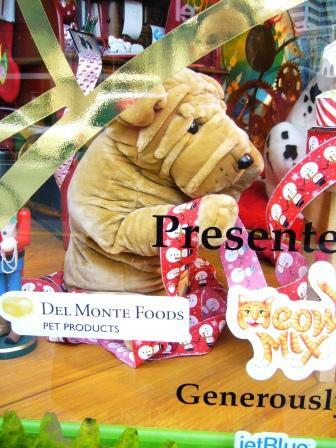 As always, we applaud holiday season pet adoptions. And the Chinese Shar Pei! 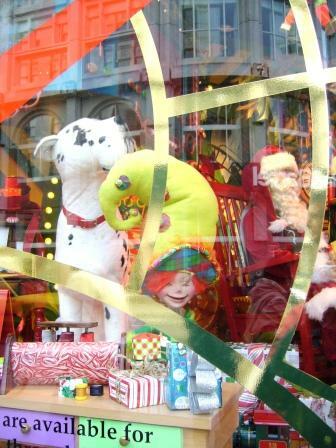 Thanks for sharing Holiday Windows with your audience. I was initially a little confused by the theme of this years windows, but when you read them “from left to right,” it begins to make sense. 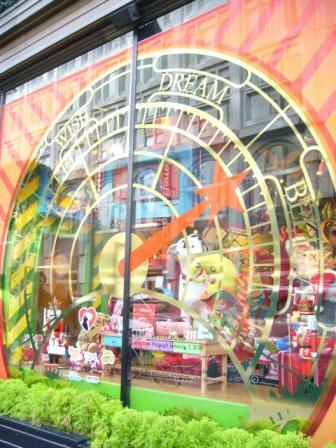 The windows tell the story of a letter’s path from a child’s hand to the North Pole. It ends with an equally wishful letter from an animal for someone to adopt her/him. It’s connected to Macy’s “million letter” campaign – for every Santa letter Macy’s receives, they will donate $1 to the Make A Wish Foundation, up to a million dollars. Thanks for the explanation, because we were so busy looking at the decor and any animals that we completely missed the theme, particularly since it isn’t directly related to animals, crowded sidewalks and chilly weather! Hope Macy’s receives lots of letters.